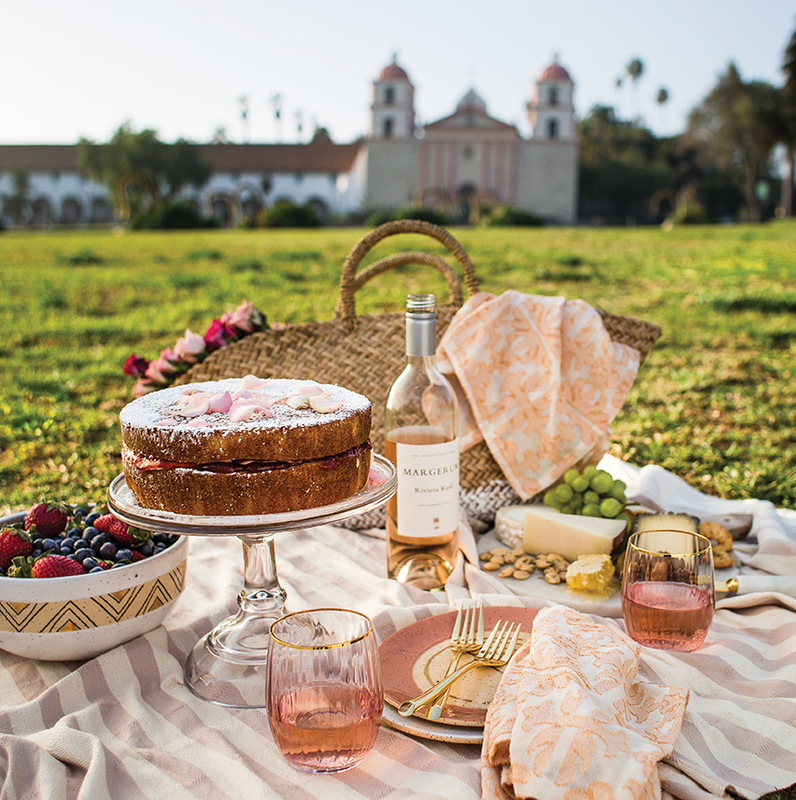 This Victoria Street Sponge Cake is the centerpiece of my dream picnic at the Rose Garden. A simple cheese board, with some nuts and fruit, and a cold glass of local rosé to accompany this sweet treat makes for an intimate and unforgettable afternoon gathering with family and friends. My obsession with this elegant cake began when I lived in London and worked in a small bakery in Primrose Hill. Kids and their parents would come in for tea after school and order a slice of this delicious layered confection, called Victoria Sponge. I loved everything about it and insisted the head baker teach me the recipe. I made it my own by adding ricotta in the cake batter and mascarpone to the icing. • Preheat oven to 350. Lightly grease and flour a 7 or 8-inch springform pan. • Beat the butter and sugar with a hand mixer until light and fluffy. • Add the lemon zest, lemon juice, egg yolks and ricotta cheese and beat until smooth. • Mix the flour, baking powder and salt together and then beat into the butter mixture until combined. • Wash the beaters thoroughly and then beat the egg whites in a separate bowl until stiff. • Gently fold the egg whites into the batter and spoon it into the prepared springform pan. • Bake for about 45 minutes, or until a cake tester stuck into the center comes out clean. with powdered sugar, and serve. • Use an electric mixer to whisk the heavy cream on medium speed until stiff peaks and set aside. • In a separate bowl, whisk the mascarpone and confectioners’ sugar together until smooth, then gently fold into the heavy cream. 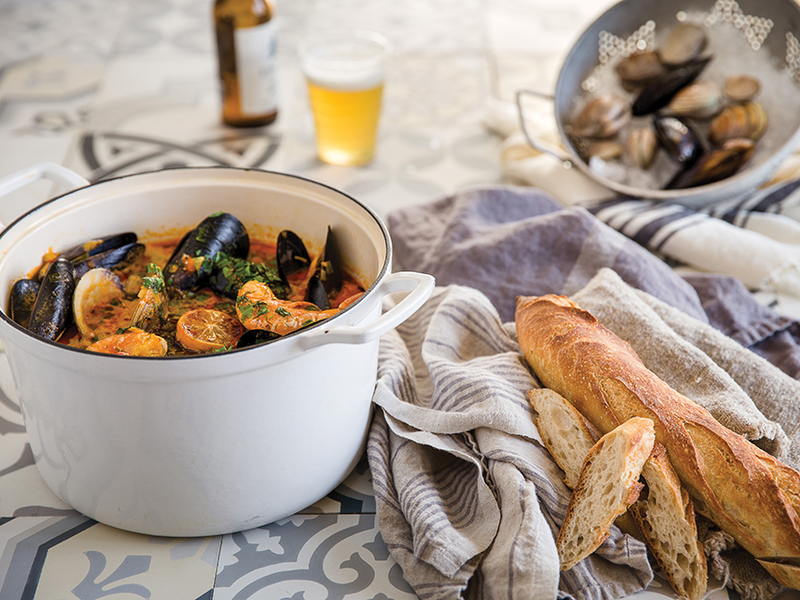 Ayda Robana of Om Sweet Mama uses a potpourri of fresh ingredients to put a North African Twist on classic Seafood Bouillabaisse. This savory medley includes clams, mussels, shrimp, chorizo, aromatic herbs, and local vegetables. Make a sofrito* from the veggies listed in Step One. Fry in 2 tablespoons of butter and 2 tablespoons of olive oil. Once softened and translucent (5-10 minutes) take them out of the large stock pot and set them aside. Add remaining olive oil and fry chorizo and potatoes for another 5-10 minutes until crispy and golden. Add aromatics (saffron, tomato paste, harissa, thyme, parsley, bay leaf, preserved lemon, garlic, salt) and the liquid (stock, lobster or clam juice, wine). Bring to a boil. Add scrubbed and debearded shellfish. Cover and simmer for 10-15 minutes, or until all the shells have opened. Add heavy cream and stir. Garnish with fresh chopped parsley and lemon wedges. *Sofrito is a sauce used as a base in Spanish, Italian, Portuguese and Latin American cooking. Preparations may vary, but it typically consists of aromatic ingredients cut into small pieces and sauteed or braised in cooking oil. 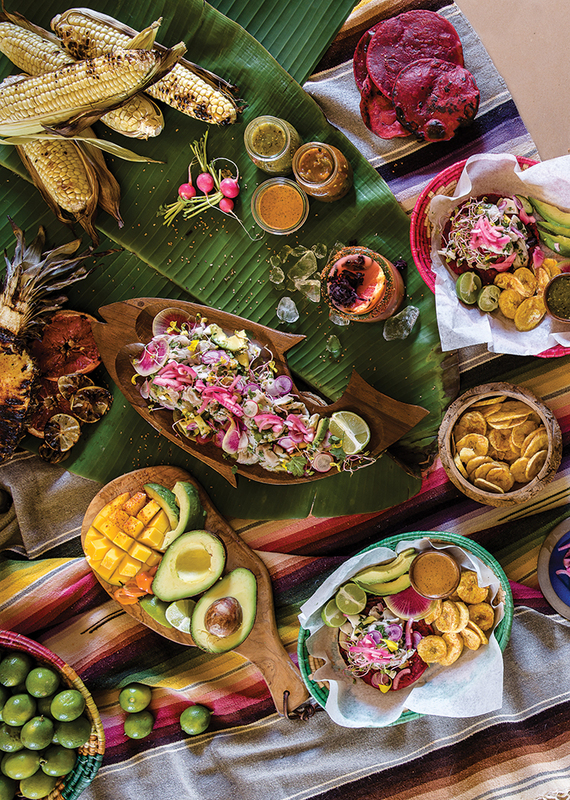 Ayda Robana of Om Sweet Mama delights the senses with her fresh take on a tropical, Mexican Cuisine-inspired menu. The recipes are simple, colorful, and as tasty as some glassy waves on a fine summer day. Cut up the fish into small cubes. Add lime juice, coconut water, onion, habanero, garlic, ginger, lemongrass, and salt. Scrape out the flesh of the young coconuts and chop into small diced pieces. Add to the mixture. Cover and refrigerate for 3-4 hours. Add cilantro, avocado, and radishes. Garnish with radish sprouts, edible flowers, and pickled onions. Serve with beet tostada, plantain chips, or corn chips and salsas. Reduce down sugar and citrus juice on medium heat in a small saucepan for 10 minutes, stirring occasionally. Turn off heat, add dried hibiscus flowers, and let steep for 1 hour until cool. Strain off the simple syrup. For the grilled citrus garnish, slice your choice of citrus (grapefruit, orange, lime, etc. ), place on a heated grill, and char on both sides. Allow cooling before adding to drink. warm our waning autumn days and longer winter nights. In a saucepan, heat up 2 cups of chicken broth with the dried porcini mushrooms and let them rehydrate for 20 minutes, simmering over medium-low heat. In a separate pot, parboil the potatoes for 10 minutes until fork tender. Meanwhile, cut chicken into bite size pieces and blot with a paper towel. Cut two pieces of bacon and render in 1 tablespoon olive oil in a large sauté pan. Add in the chicken. Cook until bacon is rendered and chicken is lightly browned. Remove from the pan and set aside. In the same sauté pan, add 1 tablespoon of olive oil and 1 tablespoon butter. Sauté leeks, onion, parboiled potatoes, carrots, celery, garlic. Strain out the porcini from the stock and chop the mushrooms, then add to the sautéing vegetables. Add salt, pepper, and fresh herbs. Add ¼ cup of the chicken-porcini stock. Sauté for 10 minutes, until vegetables soften and onions are translucent and flavors start to meld together. Remove the veggies from the sauté pan and set aside in a bowl with the chicken. In a saucepan, melt 4 tablespoons of butter. Add in the 1/3 cup of flour, whisking it until it becomes a paste. Gradually add in all the rest of the stock and the 1/3 cup of white wine, and salt and pepper to taste. Cook down until it coats the back of the spoon, making sure to whisk any clumps vigorously. Add in the chicken and vegetables and the frozen peas. In oven safe ramekins, baking dishes, or whatever vessel you want to use, put your filling in and lay the sheet of puff pastry over it, crimping the sides. You can fasten the pastry to the perimeter of your container by brushing with egg wash. Pierce a couple of small holes in the top of the puff pastry, and brush the top of the pot pie with egg wash.
Bake at 375 for 20 minutes or until the pastry is puffed and golden all the way through. Peel the pears and place in a large pot with wine, sugar, peel of orange, juice of the orange, cinnamon stick and vanilla bean (contents scraped into mixture and the exterior of the vanilla bean as well). Place star anise, cloves, cardamom pods, and peppercorns in a tied sachet of cheese cloth and pop into the wine mixture. Add salt and cook on a low heat to dissolve the sugar. Baste pears with liquid and bring to a boil, cover and simmer gently for about 30 minutes, until pear is soft when pricked with a fork. Slide the pan off heat and allow cooling to room temperature (about 2 hours or overnight for a totally saturated pear). Remove spice bouquet when ready to serve. In a cheese-cloth lined strainer, set yogurt over a bowl in the fridge for at least four hours or overnight. Toss out the strained liquid and stir in orange zest, cardamom and rose water with strained yogurt, set aside until ready to serve. Place a dollop of strained yogurt into the bottom of each individual serving glass, compote or small bowl, split the pears in half and tuck into yogurt. Drizzle a few spoonfuls of mulled wine on top of pear, top with dusting of crushed pistachios, rose petals and a little drizzle of honey. Snuggle in and enjoy this cozy fall favorite. We asked Ayda Robana of Om Sweet Mama to share a few of her favorite recipes for summer entertaining. Here, her bright, fresh dishes make the most of the season’s offerings. “This menu, along with a cold bottle of sparkling rose, is what I would serve for a light summer lunch in my garden, after a day at the beach”, says Ayda. “I believe in being intentional not only about the ingredients I use, but also how I present them - colorfully and beautifully – as a way of showing artistry on a plate.” Expressing her gratitude for the region’s bounty, she says, “We are so lucky to enjoy produce year-round from local farmers markets in the area, almost any day of the week and equally blessed by the bounties of the sea. The seafood in Santa Barbara is among the highest-quality in the United States and is coveted and revered by chefs and diners everywhere.” Ayda Robana, a private chef and caterer in Santa Barbara for the last eight years, was among the first chefs in Santa Barbara to introduce popup meals in locations around town. Her style is highly influenced by her world travels and a bi-cultural (Tunisian /American) upbringing. In celebration of her North African roots, loves to tell stories through food and gather loved ones around a table to enjoy a meal together. • In a small bowl, squeeze the juice from 1 orange. Pickle the fennel in the orange juice, rice wine vinegar, salt and sugar. Marinate while you assemble the other ingredients. • Peel and segment the other two oranges and set aside. • Thinly slice the radishes, using a mandolin if you have one, and set aside. • Lay out the thinly sliced salmon in the center of a serving platter. • Decorate the outer edge with arugula that has been lightly dressed with salt, white balsamic vinegar and olive oil. • Top the salmon with the pickled fennel, orange segments, and radishes. • Dress the salmon with the remaining pickling liquid. • Finish with Maldon salt (sea salt), fresh ground black pepper and a little sprinkle of ponzu. It's also nice to sprinkle on Japanese rice seasoning (optional). Serve immediately. • With a vegetable peeler, peel the outside of the lemons. • Carefully squeeze the juice into a saucepan, removing any seeds. • Make a simple syrup using the juice of the lemons, the peel of the lemons, 1/2 cup of sugar and 2 tablespoons of water. Cook this down for 10-15 minutes on medium heat, until it is reduced by half and the peel is tender and candied. Allow to cool. • In a separate mixing bowl, combine 2 teaspoons gelatin and 1/2 cup of whole milk. Stir together and allow to sit for 10 minutes while you make the custard base. • In a separate sauce pan, simmer 2 1/2 cups of heavy cream and the remaining 1/2 cup of whole milk, 2 tablespoons of sugar, and the seeds and pod of a scraped vanilla bean. Heat to just before boiling and using a sieve, strain in the simple syrup mixture. Save the candied lemon peels to slice and use as a garnish. Bring the mixture back to just before boiling, stirring frequently. • Remove from heat and strain again into the mixing bowl containing the milk and gelatin mixture. Whisk well, until the gelatin dissolves. • Ladle into six 2 1/2" ramekins. Allow to cool. Then individually cover each ramekin with cling wrap and refrigerate for 6 hours or overnight. • Garnish with fresh raspberries, candied lemon peel, mint leaf, lemon curd, or creme fraiche. • Toast the pepitas in a nonstick pan over low-medium heat, then coat with tamari and allow to cool. • Finely chop the shallot. • Grate the garlic and ginger into a bowl. • Add the juice of 1/2 grapefruit. • Add the rice wine vinegar, white miso and sesame oil and whisk. • While whisking, slowly incorporate the 1/3 cup of olive oil. Delight your tastebuds with my tangy Tangerine Dream Halibut with Arugula and Heirloom Tomato Salad - perfect for Easter Dinner or a Solstice Soiree. How about trying out a new gadget, the "Spiralizer" to create oodles of veggie "noodles" for my Mediterranean Rainbow Spiral Salad? Visually & texturally appealing, it's the perfect side to bring to any backyard barbeque. Looking for a new libation to quench your thirst? Try my Nancy's Santa Barbara Sunset, a cocktail worthy of all the beauty and flavors our fair city has to offer - believe me, like Goldilocks, we had fun getting this drink just right...we happily sampled our "mistakes"! Enjoy and Happy Spring & Summer to all! • Zest tangerines to have about a ½ tsp of zest - set aside. Peel tangerines, break into individual sections into the bowl, remove any pieces of pith and collect any juice as well. • Sprinkle both sides of fillets with salt and pepper. • Coat a large nonstick skillet with 2 tsp coconut oil and place over medium heat. • Add the fillets and cook about 3 minutes, gently flip and cook until the fish is opaque in the center and just cooked through - 3 to 5 minutes. • Divide between 2 serving plates; tent with foil to keep warm. • Add a tsp of butter to pan and melt over medium heat. • Add shallot and cook, stirring, until soft, about 30 seconds. • Add white wine and tangerine sections and juice; loosen any browned bits on the bottom of the pan and cook for 30 seconds. • Spoon the sauce over the fish and sprinkle each portion with red pepper flakes, and tangerine zest. Serve immediately. Salad: Toss arugula with olive oil and vinegar, place slices of tomatoes on top. Optional: You may also put salad on the plate and place the fish on a bed of salad. • Using a Spiralizer gadget, prep zucchini and carrots and place in large bowl. • Add onion, bell pepper, basil, oregano, garlic, olives, feta, extra virgin olive oil, red wine vinegar, salt, & pepper. • Fold together with spatula or wooden spoon. • You may serve immediately, however it tastes even better when you let it marinate for an hour or even overnight. • Fill highball glass with ice. • Pour one shot of Campari in, followed by 1 shot of vodka (we love Tito's Handmade Vodka). • Gently add tangerine juice, followed by a slow pour of ginger beer, and squeeze of fresh lime juice. • Heat oil in a large stockpot over medium heat. Add onion and cook until softened. • Add carrots, celery, garlic, chili flakes, cumin, turmeric, paprika salt, and pepper. • Cook for 5 minutes and continue to stir. • Add tomatoes, lentils, cilantro and stock. • Bring to a boil, then reduce heat to low and simmer, covered, until lentils are soft, about 30 minutes. • Garnish with cilantro sprigs & serve. • Combine rice and 1 cinnamon stick in a blender or spice grinder and pulverize into a fine powder. The finer the powder the better the horchata. Put in large bowl. • Put almonds into the blender/spice grinder and do the same thing­­. Make sure not to let the almonds turn into almond butter. Pulverize until they are powdery. Add into bowl with rice/cinnamon combo. • Add 6 cups of hot water, mix with wire whisk, cover and let stand overnight at room temperature. • The next day, transfer half of mixture into blender and add 1 additional cup of cold water. Blend well, pour into new large bowl, set aside. • Add the second half batch into blender and repeat. It’s critical to blend all the lumps out. Add second batch to large bowl. • Get yet another bowl or pot and pour mixture through a fine sieve lined with cheesecloth, using fresh cheesecloth every time. Repeat this process 4 times for optimal smooth horchata. • Once horchata is strained, add vanilla and whisk by hand until completely blended. • In a large measuring cup, dissolve sugar into boiling water to make into simple syrup, let cool and mix into horchata. • Fill a highball glass with crushed ice, add 1 shot of rum, and pour in 6-­8 oz. of horchata, mix with cinnamon stick, grate fresh cinnamon on top. Serve.